A Coastguard helicopter crew carried out a "rare and tricky" manoeuvre in bad weather to rescue a walker on Ben Nevis on Wednesday night. 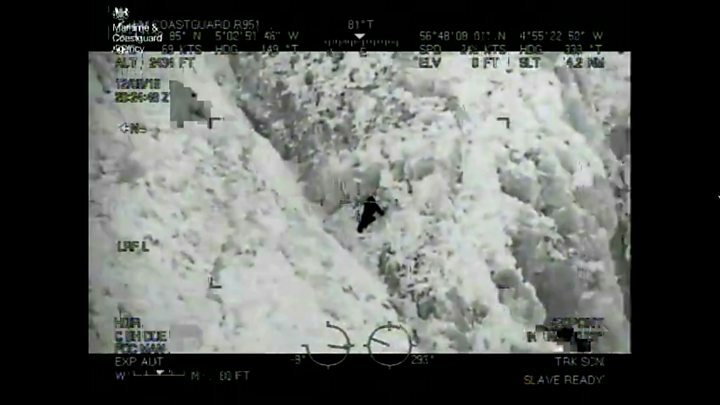 Because of severe turbulence and poor visibility, the Maritime and Coastguard Agency (MCA) said the helicopter had to be reversed into a "notorious" gully. The man was on a ledge in Five Finger Gully, which has a sheer drop below and is known for climber fatalities. He was spotted in the dark due to the light on his phone. The MCA said the man was "ill-equipped" for conditions on Ben Nevis and was found about mile from where he believed he was on the mountain. Weather conditions on Wednesday night included driving rain, mist and strong winds. Lochaber Mountain Rescue Team and Inverness Coastguard helicopter crew searched for the walker. He was spotted on the ledge by Winch Operator Mark Lean, after an initial "glimpse" was caught on the helicopter's infra red camera. The winch operator said: "The casualty was hard to locate as he was wearing all black and the only illumination was the back light of his mobile phone. "His location was in the notorious Five Finger Gully which has a sad history of fatalities and complicated technical rescues after navigational errors by walkers. "Last night in severe turbulence and poor visibility, the crew of Rescue 951 had to reverse the helicopter into the gully in order to achieve the rescue. "The casualty was precariously perched on a ledge with a sheer drop below and was still attempting to shuffle down the gully. "Thankfully, he was uninjured and we were able to bring him to safety." A spokeswoman for the MCA described the reversing of the helicopter during the rescue as "rare and tricky".